The stunning Ford Evos Concept car will make its first appearance in North America as the centerpiece of Fords display at the 2012 International CES in Las Vegas, Jan. 10-13, 2012. The Evos Concept made its global debut at the 2011 Frankfurt Motor Show in September. 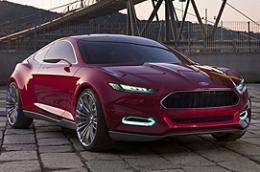 The Ford Evos Concept embodies the companys new global design language while providing a glimpse at Fords technology future highlighted by the use of cloud computing to enhance the driving experience. The Evos Concept integrates technology in a holistic way meant to enrich the driving experience. By exchanging data with the cloud, the Evos extends the connected lifestyle from home and office to the vehicle, providing new possibilities for personalization and adaptability of the car. Through integration of on-board data about driver preferences with cloud-based information such as work schedules, music and weather conditions, and local data delivered through vehicle-to-vehicle communications, Evos Concept aims to make life simpler. The car gets to know you and can act as a personal assistant to handle some of the usual routines of a daily commute, said Mascarenas. Ford researchers have also incorporated technologies to enhance driver health and wellness while at the wheel. Features such as the heart-rate monitoring seat and certified allergy-free interiors connect to the cloud to monitor the physical state and workload of the driver, and adjust the driving experience accordingly. Evos also utilizes the power of the cloud to understand driver behavior and travel patterns in order to make predictions about destinations and to adjust the control strategies for the state-of-the-art lithium-ion plug-in-hybrid powertrain. Through understanding where the driver is likely to go, Evos can intelligently switch between running on battery or engine power in order to use the least amount of energy for any situation. Alan Mulally, president and CEO of Ford Motor Company, will be returning to the International CES stage for the fourth consecutive year, participating in the 2012 Innovation Power Panel keynote. The Innovation Power Panel will be held at the Las Vegas Hilton on Wednesday, Jan. 11 at 9 a.m.